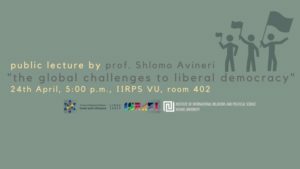 Institute of International Relations and Political Science of Vilnius University (IIRPS VU) together with Embassy of Israel in Vilnius invites to the public lecture by prof. Shlomo Avineri “The Global Challenges to Liberal Democracy”. Event will take place Monday, 24th of April, at 5:00 p.m., IIRPS VU (Vokiečių str.. 10), room 402. Shlomo Avineri is Professor of Political Science at the Hebrew University of Jerusalem and member of the Israel Academy of Sciences and Humanities. He served as Director-General of Israel’s Ministry of Foreign Affairs in the government of Prime Minister Yitzhak Rabin. He is currently Recurring Visiting Professor at the Central European University in Budapest. He has been recently elected to the Polish Academy of Arts and Sciences in Krakow. 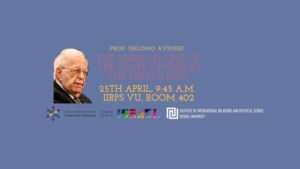 Institute of International Relations and Political Science of Vilnius University (IIRPS VU) together with Embassy of Israel in Vilnius invites to the public lecture by prof. Shlomo Avineri “The Unravelling of the State System in the Middle East”. Event will take place Tuesday, 25th of April, at 9:45 a.m., IIRPS VU (Vokiečių str.. 10), room 402. The Conference on Bridging gender research and policy making: missing links, good practices, future scenarios is organised by ATGENDER, with support by EIGE and VU. You could find more information about the event here.